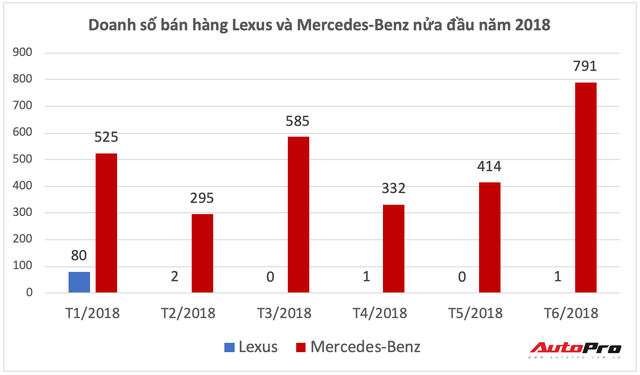 VietNamNet Bridge - Among luxury car brands, Lexus suffered most from strict regulations stipulated in Decree 116 on conditions to manufacture and import cars to Vietnam. Lexus importers had to contact agencies from third countries for necessary documents. No Lexus car was sold in the first half of 2018. Mercedes Benz Vietnam’s (MBV) products were still available in the Vietnamese market during that time. These included domestically assembled models – C-Class, E-Class, S-Class and GLC. Though the sales went down, MBV still sold 300-400 products a month in the first half of last year. Unlike Lexus, MBV could meet administrative procedures to import the first consignments of products in early 2018. About 400 Mercedes cars were sold via Thaco distribution network, but that was more satisfactory than Lexus, with only 84 sold. Among luxury car brands, Lexus suffered most from strict regulations stipulated in Decree 116 on conditions to manufacture and import cars to Vietnam. Lexus returned to Vietnam in September 2018 when 83 products were delivered. The sales have been increasing steadily. In November 2018, Lexus sold 107 vehicles. The Japanese brand not only increased its supply in Vietnam, but also tried to upgrade its products. RX, for example, has four versions available this year instead of two as seen last year. Meanwhile, RX200t has been renamed RX300 with a new LED lamp. RX450h, the highest level version, uses a hybrid engine. SUVs are a successful product line of Lexus in Vietnam. At the Vietnam Motorshow 2018, Lexus introduced the next generation of ES model with ES300h version. And later it introduced ES250. Lexus ES is the major rival of Mercedes Benz E-Class and BMW 5-Series in the market. In the F-class market segment, Lexus brought LS500 to Vietnam to compete with Mercedes’ S-Class and 7-Series. Lexus remains a favorite brand of Vietnamese. However, Mercedes Benz’s sales are much higher. In November 2018, MBV sold 680 products with sales 4-6 times higher than Lexus on average. MBV has outstanding strength in products priced at below VND2 billion, which Lexus does not have. C-Class and GLC, with attractive prices of VND1.5 and VND1.7 billion, are bringing big turnover to MBV. GLC is the top luxury seller. Reports show that Vietnamese spend tens of trillion of dong every year to import luxury cars despite the modest average income of over $2,000 per annum. They have shifted from cheaper to mid-tier cars, while luxury cars have been selling better. As many as 8,670 luxury cars of different kinds were sold in Vietnam in 2017.